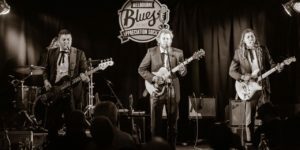 Appearing on Triple M was the beginning of a whirlwind for Josh (lead vocals, rhythm​​ guitar, harmonica) and Sam Tesky (lead guitar, backing vocals) alongside their life-long mates Brendon (bass and backing vocals) and Liam Gough (drums, backing vocals).​​ Half Mile Harvest​​ landed on the ARIA album chart at Number 18 and took out the​​ Number ONE on the Australian Independent Release chart​​ the following week! So what does​​ Half Mile Harvest​​ sound like? Together The Tesky Brothers have created a debut album full of tunes that could be mistaken for​​ tracks that​​ were recorded in​​ America’s deep-south, but were​​ in fact​​ recorded in their Melbourne home studio. While​​ listening to​​ Half Mile Harvest, I was transported to a house in the Mount Dandenongs (a forestry place in Melbourne’s scenic rangers) or a pub where the lads were jamming away. Their stand-out track​​ Honeymoon​​ is eleven minutes and forty-four seconds of mood-altering music which goes from a dreamy pace to a jamming section to a quicker pace to an uncertain ending.​​ Shiny Moon​​ is a gorgeous track bringing back childhood and teenage memories. It has the lyrics “she seduces me” and “shiny moon gonna help me”​​ that​​ grabbed onto my heart as it’s a gorgeous notion. Congratulations​​ guys for your recent whirlwind​​ success! Hearing​​ Pain And Misery​​ live on Melbourne’s​​ Triple M’s Breakfast Show, like millions of Aussies I fell in love with your sound. Thanks Jacqui, we’re glad you like it. You described it well because it certainly feels like a whirlwind. The past few weeks have been crazy. We are really thankful. Honeymoon​​ was written by Sam Teskey. He had the lyrics and most of the song together. He brought it to the studio one day and we began work on it immediately. The song became sort of a representation of the album as a whole in terms of themes and emotion. After we came up with the arrangement together, we tracked the whole song as a band together live in a room and what you hear on the album is the result. Nice one Jac, I had a listen to their tracks and I like their sound. Good interview.